The first chemotherapy drugs in Liam’s treatment were topotecan and cyclophosphamide. He received two five-day treatments with these drugs. The first was during Aug 2014 and the second was in Sept. 2014 (separated by four weeks). 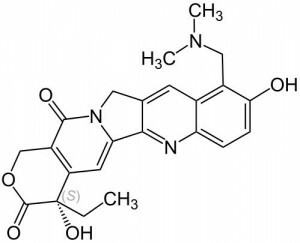 Even though chemotherapy drugs are often given in pairs to give a compounded blow to the cancer, in these blog posts I will explain the mechanism of each drug individually so that it can be digested by the audience. 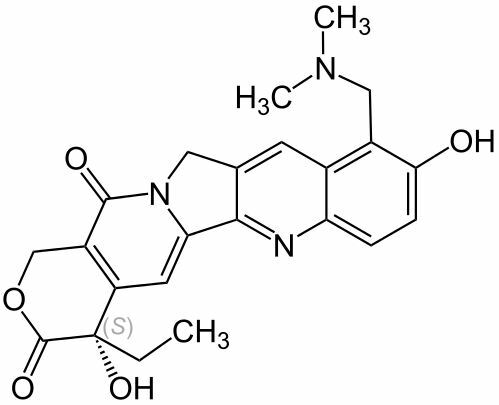 Topotecan is a topoisomerase I inhibitor which is derived from a plant called the Asian “Happy Tree” (Camptotheca acuminata). 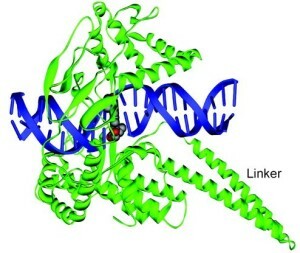 Topoisomerase I, discussed in a previous blog post, is an enzyme that relieves torsional strain ahead of the advancing DNA replication fork. 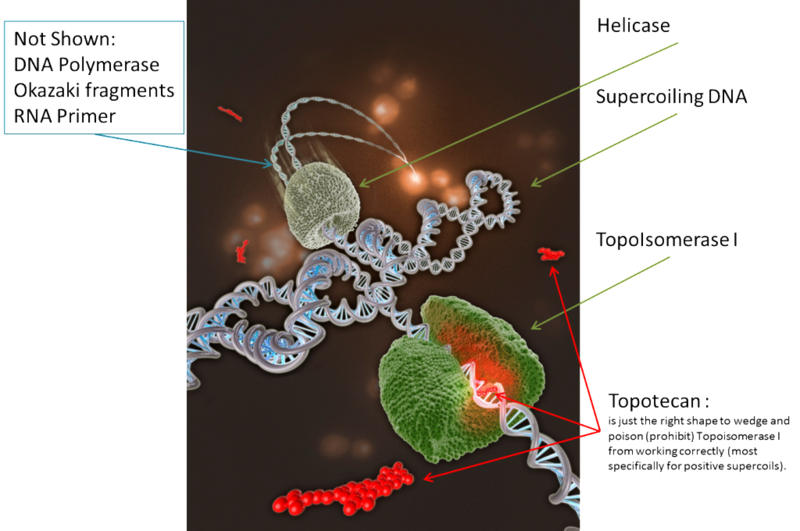 Without this torsional strain relief, the DNA is too strained to be able to separate into two strands. The intercalation of topotecan causes a shift of the downstream bases by ~3.6 Angstroms (defining the displacement that this monkey wrench causes in the system). Figures 2 and 3 show ribbon diagrams of both the regular process and the process that is poisoned by topotecan. 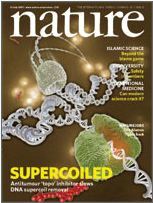 An article in Nature  provides evidence that topisomerase I is inhibited (poisoned) more readily when the forming supercoil has a positive coiling direction. 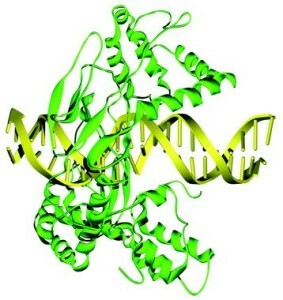 Topotecan has the effect of being a monkey wrench in the topoisomerase I process. In slightly easier to understand terms, the topotecan is just the perfect shape with just the right bonding attachments to act like something getting stuck in a zipper. Eventually, with enough vibrations and thrashing about, the topotecan will get unstuck, but cancer is impatient with the process and typically triggers the apoptosis alarm (cell death trigger) before it can work the topotecan out of the zipper.